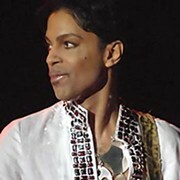 Prince's latest single tosses off some of the rock 'n' roll influence for which the musician was only slightly lauded. The pop glory is there - and in full swing - as well. His new website, 20pr1nc3.com, sorta hints at more Prince awesomeness to come (depending, of course, on how you define "awesomeness"). And THIS, in related news, has been the first post in a new series that we probably won't continue called Forcing The Eighties Revival On Unwitting Readers.